At Harworth Church of England Academy we continue to maintain and stengthen our links with many groups and people within our local community. Here are a few examples of the many community events we attend and support. Class 6 sang Christmas carols and songs at the Town Hall to elderly residents of Harworth and Bircotes during their Vintage Afternoon Tea. Year 5 and 6 pupils raised awareness of Polio by working alongside the Rotary Club to find out all about the disease and which countries it still exists in. Each class visits the library and they have the opportunity to become a member. Year 6 pupils undertake a 10 week programme every year with the local DARE officer resulting in a graduation to present their work. As part of our Speed Watch project the Year 6 pupils work alongside the local police to raise awareness of speeding motorists outside school. The children are taught how to use speed cameras and design questionnaires to ask motorists who are driving above the speed limit. Motorists then face the choice of paying the fine or attending an assembly in school based on keeping our children safe. Local businesses are welcome to come and have a cup of coffee on Friday 31st March at 9am. Class 2 have visited the Fire Station as a much valued link within the community. Whole school assemblies and learning sessions in classes have also taken place this year. The school has developed links with this local business and they kindly donated and presented a set of Michael Morpurgo books to Class 6. The whole school and staff supported the annual community Christmas event at Harworth Town Hall. They joined to sing Christmas carls with the family of schools. Class 6 continued to entertain the residents of Brailsford House by singing Christmas carols to them before chatting to them and sharing refreshments. Reverend Frank led our Harvest Festival in school. Parents/carers were invited to join us. We raised some money during the Tour de Yorkshire and gave it to their cycling club. Worksop Rotary Club donated over a thousand crocus bulbs for us to plant to raise awareness of polio in developing countries. We supported this charity on one of our regular coffee mornings. Parents made cakes and buns to raise money for this charity. This event was run by our parents Happi group in the school hall. Parents, grandparents,staff and friends had a wonderful time on our annual shopping day in York. This annual event has been held every November for over 25 years. Year 5 children along with staff and parents attended the service at the Cenotaph in Harworth. All children and staff dressed as super heroes to support this charity. Children from all year groups joined in with singing Christmas songs at our Town Hall at the annual event of turning on the Christmas lights. Parents, staff ,governors and friends had a wonderful evening at Styrrup golf club at our annual Christmas ball organised by our parents Happi group. All children and staff supported this day by wearing Christmas jumpers. A coffee morning was held with a tour de Yorkshire theme. Cakes and buns were sold and monies raised are to donated to our local cycling club. On Friday 10th June our school choir were invited to sing at the town hall to members of the community who are 90 years of age or over. This was an after school event and we would like to say thank you to all those children who sang and to the parents for supporting them. 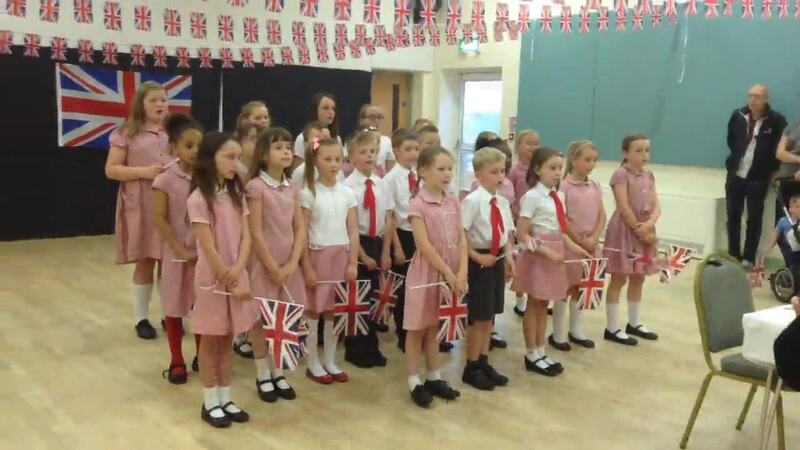 The choir sang a medley of songs including 'The White Cliffs of Dover'. Since the event we have received many lovely comments about how well the children sang and we were also in The Worksop Guardian. Please click on the video clip below to hear our wonderful children sing.